Daphne (pronounced DAFF-nee) is a compact, fantastically aromatic shrub that produces a profusion of flower blossoms in clusters over its compact form over many months. It is a tidy landscape shrub for group plantings or containers. All our Daphne Plants for sale are shipped with very well-established root systems. We guarantee them to arrive alive and thriving. The ‘Eternal Fragrance’ Daphne Plant is, according to just about everyone, the most fragrant Daphne ever. 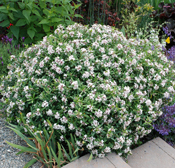 Blooming from spring to fall, this floriferous shrub bears blushing pink and white blossoms from early spring through early fall and requires almost no maintenance to present a courteous, compact appearance. Its compact size makes it ideal for just about any application; plant it in your fanciest container or use this Daphne as a border plant or low-growing hedge.